Country music’s rising up-and-comer, Sandra Lynn, has debuted the music video for her latest holiday single, “My Christmas Wish for You” on CMT Music, CMT.com and Country Rebel. 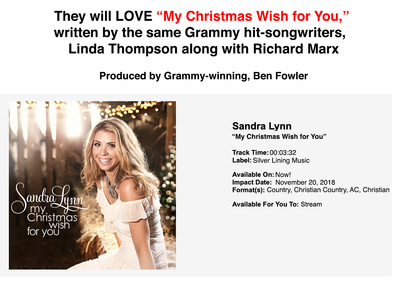 The encouraging and hopeful track was written by Grammy Award-winning, hit songwriters, Linda Thompson and Richard Marx as well as produced by Grammy Award-winning engineer and producer, Ben Fowler. In the video, directed by husband and wife duo, Brandon Hess and Tara Tucker (Tucker/Hess Productions), we follow the singer/songwriter as she delivers the song’s timeless lyric along the reflective beaches of the Southern California coast and a cozy living room fireside, all interwoven with nostalgic home videos from throughout Lynn’s childhood. This past November, the singer/songwriter had achieved a career milestone with her debut performance at Nashville’s iconic Ryman Auditorium. Sandra participated in the annual Christmas 4 Kids concert event where she sang “My Christmas Wish for You.” The event helps to generate funds to give over 400 children from 29 different schools, a day-long shopping excursion. Sandra also recently returned to her alma mater, Pepperdine University where she performed her soon-to-be holiday classic alongside Seaver College’s celebrated orchestra. Since launching herself as an independent artist in 2014, singer and songwriter, Sandra Lynn, has established herself as one of country music’s sweetest rising voices. Lynn began singing at the age of seven and immediately gravitated toward such iconic artists as Trisha Yearwood and Dixie Chicks, as well as Shania Twain and Faith Hill. Since then, Lynn has spent much of her time in Music City with some of Nashville’s hottest songwriters and hit-makers, including Rascal Flatts’ Jay DeMarcus, Dave Brainard, Ross Copperman (who produced Lynn’s single, “Afterparty,” which was picked up by SiriusXM’s The Highway, along with her song “Bar-Hoppin”), Jeremy Spillman, Hall of Famer members Gary Burr and Tom Schuyler, Tia Sillers, Victoria Banks, among many others. Lynn has also made a name for herself on the live circuit, opening for Brad Paisley, Kenny Chesney, Cole Swindell, Kenny Rogers, Jana Kramer, and Josh Thompson, as well as performing during CMA Fest at Milwaukee’s Summerfest, and playing local Nashville venues, including 3rd and Lindsley, The Wildhorse Saloon, and The Listening Room. In 2018, Lynn released her deeply emotional EP, FIGHT, produced and engineered by Grammy-winner, Ben Fowler which kicked off a three-part series of EPs documenting the push and pull of a couple trying to save their relationship.